Because of the long-term influence of crustal movement, weather environment, and man-made construction (such as field blasting under road repairs, etc. ), the tower is prone to tilting, especially in winter, covered by ice and snow, which is more susceptible to both freezing and gravity. 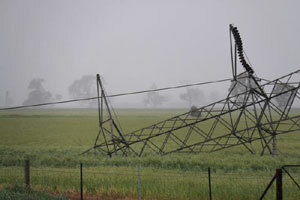 The tower is tilted and deformed due to stress changes, which causes various unpredictable serious consequences such as the breakage of the transmission line and the collapse of the tower. This not only causes heavy obstacles to the repair, but may even endanger people's lives. By using digital inclinometer to monitor the erect state of the tower, the maintenance personnel can understand the daily safety status of tower in time at home or office via the internet. Via setting a safe tilt range, an alarm can be issued when the tilt angle reaches a critical value. When the tower is abnormally tilted, the timely alarm of the tilt sensor can help the tower maintenance personnel to quickly find the accident occurrence point for repair, thus ensuring that the tower can resume normal operation in time. a. Tower top: the dynamic tilt monitoring range is ≤±30°; the resolution is 0.05°. b. Tower body: the static tilt monitoring range is ≤15°; the resolution is 0.01° or 2”. c. Tower settlement: the long-term non-uniform settlement monitoring range of tower foundation is ≤±15° @0.6503m/m; the resolution is 0.0025°@0.05mm/m. a. Communication field: Security monitoring of communication towers such as mobile, telecommunications and railway. b. Power field: National power tower safety monitoring. c. Other areas: advertising towers, building security monitoring. The dynamic tilt sensor is horizontally installed at the tower spire, so the roll angle and the pitch angle of tower top in the process of applying external force such as natural wind are monitored in real time. The static inclination sensor is horizontally installed in the middle of the tower (tower body), and the horizontal inclination of the entire tower is monitored for a long time (ie, the X-axis inclination angle and the Y-axis inclination angle). The electric tilt beam sensor is installed on the tower base for monitoring the long-term non-uniform settlement displacement. For miniature communication towers, the tower base is fixed in a pre-cast concrete pier. It is usually necessary to fix a reference rod beside the concrete pier (the reference rod does not settle), and then place one or more series-wound electric tilt beam sensors between the concrete pier and reference rod. In this way, the settlement of the tower foundation concrete pier can be indirectly calculated by the inclination angle of the electric tilt beam sensors. For large power towers, the four bases of the tower are usually fixed in four evenly distributed concrete piers, and there are horizontal support beams around the lower part of the tower. For this site, usually only four electric tilt beam sensors are fixed on the horizontal support beams around the iron tower, so that the vertical settlement of the iron tower can be calculated indirectly by the inclination angle of the four electric horizontal beam sensors combined with the distance between the concrete piers. SST20 is specially designed for low-cost and high-reliability application scenarios which suits for high-volume measurement requirements. Our engineers has carried out several optimizations and integrations for it. The SST20 is horizontally installed on the tower body through the mounting bracket. The tower will be horizontally tilted under the influence of natural wind, tower base geological changes and other factors, however, the SST20 tilt sensor can directly monitor the long-term horizontal inclination of the tower in time. SST400 digital inclinometer is an upgraded product on the basis of original static tilt monitoring technology which is rigorously tested and perfected in EDA & CAE simulation, assembly processes such as material selection, heat treatment, modal analysis and testing (including housing, sensitive devices, PCB boards, and related characteristics), and finite element analysis, etc. Similarly, the SST400 is installed horizontally on the tower body (in the middle of the tower) through the mounting bracket, which can more accurately monitor the long-term horizontal inclination of the tower. SST810 dynamic tilt sensor is an inertial product that provides dynamic roll and pitch angle measurement for moving objects, achieving a 50Hz refresh rate. SST810 is horizontally mounted to the tower top through the mounting bracket, and the tilt of tower top can be transmitted to the SST810 through the bracket. SST810 has a built-in three-axis accelerometer and a three-axis gyroscope. When the tower is subjected to dynamic rocking and tilting caused by external forces such as natural wind, SST810 can directly measure the dynamic tilt angle and swing direction of the tower in real time. The electric tilt beam sensor was developed by Vigor Technology with patented tilt measurement technology for non-uniform settlement monitoring. This tilt beam sensor is used to detect the angular change between the two determined points. The tilt sensor is mounted in a rigid beam with a standard length of 1 m (2 m, 3 m optional). The beam is mounted on the structure to be monitored, and the angular change can be measured and converted into displacement relative to the beam length. A plurality of such electric tilt beam sensors are connected in series to accurately monitor the non-uniform settlement of the measured carrier over a long distance. The static levelmeter is a precision instrument that measures the relative elevation changes between two or more points. During the trial usage, a plurality of static levelmeter are connected by a liquid-passing tube, and each static level is measured by a high-precision pressure sensor, and the pressure of the sensor changes synchronously with the change of the liquid level, thereby measuring the liquid of each measuring point. In the static level system, the vertical displacement of all the measuring points is changed relative to one point (also called the reference point), the vertical displacement of the point is relatively constant or can be accurately determined by other means, so as to accurately calculate the amount of settlement change at each measuring point of the static levelmeter system. Vigor Technology provides a complete tower safety monitoring system for communication towers, transmission towers and etc., if you want to learn more about it, please visit this link.